Ah, yes. I guess it was inevitable that there would be a third Toy Story. And hopping on the 3-D bandwagon isn't too surprising either. But where threequels (is that what they're called?) like Shrek the Third, Rush Hour 3, and even to a lesser extent, Final Destination 3 recycle some of the same jokes, I never felt like that watching Toy Story 3. I did groan when I heard this third movie was coming out, because I thought Pixar couldn't top itself from the first two. I don't know if it was the 11 year layoff between the second and third movies, but I was definitely wrong--this one's as good as, if not better than, the first two. I didn't bother with the 3-D feature (also because it wasn't being offered at the theater), so I can't speak to that. But what I can say is that Toy Story 3 will run you through a gamut of emotions. In just a matter of minutes, I went from falling out of my chair laughing (also known as "roflcoptering"), to choked up emotion, to gripping the edge of my seat, to anger...basically you go through it all as you watch Woody and the gang partake in some zany adventures. This movie finds the toys' owner, Andy, going away to college. He has to choose which toys to keep, which ones to ditch, and, for the really lucky ones, which ones are coming with him to the university. Of course, nothing goes as smoothly as planned, and the toys end up in a daycare. This is where the creators can really shine, and they absolutely do--TONS of new toys make appearances, including a well-known couple that steals the show whenever they're onscreen. Of course, all of the favorites are back. I've always had the a spot for Slink, maybe just because I love daschunds and Slinkies. But easily the best performance is by Don Rickles, who once again reprises his role as Mr. Potato Head. Rickles might not even have the funniest lines of the cast, but the situations MPH gets himself into more than make up for it. And Pixar's visuals only get better with time. I won't spoil the ending (because that would be a pretty terrible review, wouldn't it? 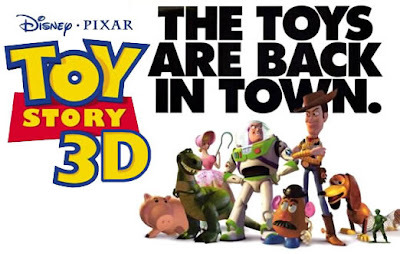 ), but know this--Toy Story 3 is not just a movie for children. In fact, I'd go so far as to say adults might appreciate it more. Sure, the kids will laugh at the way the toys are used and exploited, but there are quite a few adult themes sprinkled throughout. In one of the final scenes, there was a pause in the dialogue, and a young girl in the theater said, "It's ok, mommy, don't cry." That sums up the experience of Toy Story 3--the ending is bittersweet (and insanely intense), even for, or maybe especially for, adults, but you'll be laughing and smiling so much along the way that it doesn't matter. Who knows? You just might spot some toys that provided, or still provide, hours of entertainment, and if not, the toys of Toy Story 3 are happy to do the job.